Home Everything else Best Gifts for Dad. Father’s Day is fast approaching and if you are looking for the perfect gift for your dad this year, we got you covered. This post was supposed to come a week earlier but due to mix up we got delayed, yet we are sure that you are really going to like this one. Sugru: Sugru is a really cool thing that you should consider taking along on your next camping. It allows you to improvise things and fix them too. It’s perfect for outdoors; is strong and durable and can withstand the weather. Sugru can be used to fix anything, which includes your camping gear. All it needs is 24 hours to turn it into a durable, flexible rubber that stays stuck once you use it to build, seal, fix, create, and stick things together. Its flexible, comfortable to touch and also grippy, can withstand temperatures from -50°C (-58°F) to +180°C (356°F), waterproof and removable. Skylock: This is the world’s first solar-powered connected bike lock that alerts you when it senses anything out of the ordinary with your bike, and instantly sends you a notification. It works with your iPhone or Android device. Cycle Power Generator: This compact, easy to install generator uses your pedal power to recharge smart phone, GPS and other gadgets. Patchnride: What makes this small handheld tool useful to you is the fact that it can repair punctured bike tires in 60 seconds and what more you don’t even need to remove the tire from the bike. Bluesmart Smart Suitcase: Bluesmart, is the world’s first smart carryon suitcase that you can control from your smartphone, lock and unlock it, weigh it, track its location, be notified if you are leaving it behind and find out more about your travel habits. What more, it even recharges your gadgets. Woolet: Woolet is a smart wallet that keeps your cash and cards safe. Its ultra slim, Bluetooth-powered, self-recharging and combines the best of technology with skilled handcrafting. It syncs with your iOS and Android smartphone, and it alerts you if you leave your wallet behind. It lets you specify any distance between 20-85 feet (6-25m) to get automatic alerts. Use the built-in distance tracker or get it to ring with the tap of a finger to find it. Your phone automatically records the last location it saw your Woolet. If you happen to loose it, you can activate the Woolet crowd detection network, and others with Woolet will start scanning for your wallet and once they get within range, the GPS location is instantly updated to your phone. ChatSim: ChatSim lets you stay in touch with the world; it connects your ChatApps like WhatsApp, Telegram, Facebook, Messenger, WeChat, Skype, Viber, LINE, Hangouts, iMessage, QQ and all other Instant Messaging apps around the world. You can send and receive photos, videos, voice messages, your location and contacts in every corner of the planet and tell everyone where you are when you are traveling. It connects to more than 400 service providers in about 150 countries and automatically searches for the best provider for best coverage and signal right where you are. All this will cost you €10 a year. Hush: These smart earplugs are wireless noise masking earplugs that block out the world, allows you to sleep comfortably and yet wakes you up for the things that matter you the most. It notifies you and you alone, that way when your alert goes off it doesn’t bother anyone else. It can play soothing sounds for you to fall asleep. Its app allows you to control. And if you misplace the device, you track them through its app and make them sound to find them. These are ideal for travelers; on a loud flight, sleeping isn’t always most pleasant because of noise, and bulky headphones are uncomfortable. Hush provides you a lightweight wireless solution for this. Qmote: Qmote is a multifunctional, single-button remote that allows you to perform actions on your smartphone, even when it’s out of reach. It uses predefined click patterns to control functions on your smartphone; your smartphone acts as a smart hub, while Qmote provides you easy and intuitive functionality, all at the click of a button. You can use it to control music, take photos, record videos, find your phone, record audio, take screenshots, make calls, send location and texts, and more. And Qmote is fully IFTTT integrated. Nexpaq: Nexpaq is a smart modular smartphone case that lets you to easily customize, and enhance features to your smartphone through the case. You can mix-and-match from a variety of modules to increase functionality of your phone, like additional power, an amplified speaker, a temperature and humiditysensor, storage, card reader, breathalyzer and more. It is available in black or white for iPhone 6, Samsung Galaxy S6 Edge and Samsung Galaxy S5. Droplet: Droplet is a smart button that lets you track important activities you don’t want to forget. This wireless button can be attached to anything that needs a reminder. You can use it for setting reminders for healthy living, daily tracking, kids chores, household activities, nighttime routines and more. All you need to do is simply attach Droplet to an object and tap it when you complete the task. It will record it through its app so you can keep track of your activities and goals. You can set it to only remind you if you have forgotten the task, how and when you want to be reminded. It comes with a smart hub, and multiple buttons can be connected to one hub. You can configure Droplet to alert the other family members if shared chore is forgotten and more. Duet: Duet by Protag is a smart device to have along; it measures 2.8 cm X 2.8 cm, and can be easily attached to keys. Its app will alert you when you leave your Duet behind and record its location. All you need to do is retrace your steps to that location and use its smart radar to determine if your item is within 30m (100 feet) from you. And if your phone is separated then your Duet alerts you immediately. Use the Protag Trace to track your phone’s location and retrace your steps back to that location and press the button on Duet to ring your phone once it is within 30m from you. Its smart, with Wi-Fi Safe zones and it knows when to alert you, and when not to, useful especially in classrooms. Apart from keys it can be easily attached to your laptop sleeve, bag and more. Its available in 5 colors, its app can track up to 10 duets, and is compatible with iOS and Android smart phone. LyfeLens: This smart device allows you to keep an eye on your car. It features dual-facing HD cameras, detectionsensors, built-in GPS, 4G LTE WiFi hotspot and cloudstorage. The device allows you to monitor your car from your smartphone. Its app provides you with a live videofeed and lets you know what’s happening inside and outside the car. And if you miss anything, it stores the footage on the internal storage or sends it to the cloudserver. The built-in GPS provides real-time speed, location information of your car and stores your tour data securely to the cloudserver. It provides a push notification to your smartphone if anything goes wrong with your car. Its 4G LTE Wi-Fi hotspot keeps all your gadgets connected while you’re on the move. Drop Stop Car Wedge: The gap between the center console and front seat is where you mostly drop your keys, smartphone, pens, jewelry and more. To prevent this we have for you ‘Drop Stop Car Wedge’, which blocks the gap, comes in black neoprene casing. Anti Sleep Pilot: This little gizmo keeps you up and safe; it calculates your tiredness level, maintains your alertness, recommends a break and features easy to use design.Moj.io: Moj.io plugs into your car’s OBD port, uses the mobile network to connect your car to the Internet, and apps on your smartphone and makes your car a fully connected part of your life. It provides real-time data on engine performance, temperature, road surface, speed, pitch, tire pressure, GPS location and more on your smartphone app. Grill Wrangler: Grill Wrangler is a 3-in-1 BBQ tool; it comes with a simple slide-n-lock mechanism and transforms to tongs to spatula to grilling fork. Camouflage BBQ Grill Apron: This camouflage BBQ grill apron comes with a bottle opener, 3 XL tool pockets, 4 sauce pockets, salt and pepper spice pockets and belt that holds 6 beverage cans.Porter – Grab and Grill: The Grab and Grill is a multi-purpose BBQ tray. It comes with containers, servingplatter and condiment caddy that holds everything a grill chef requires. Looftlighter BBQ Starter: The Looftlighter solves the whole hassle of starting up a charcoal grill. RhinoBoss: RhinoBoss is a portable home gym that provides you full body workout. Its uniqueness comes in its space saving design; it is a completely customizable system, allows you to choose your strength level anywhere between 1-450lbs. You also get access to virtual gym with step-by-step instructions to follow. MOTi: MOTi is a gym wearable device that coaches you through your workout sessions and motivates you. You can wear it on wrist/ankle, or thigh and it identifies types of workout, logs your reps, calculates calories used. Nike Fuelband: Nike Fuelband using an accelerometer tracks your running, walking, dancing, basketball and dozens of everyday activities. All you need to do is set your daily goal and it tracks your progress, lighting up from red to green throughout the day. Green means you have achieved your goal. It syncs with iOS5 via Bluetooth or plug it directly into your computer’s USB port to visualize your results. Smart Skipping Rope: This smart skipping rope is designed to encourage you to get more active. It features Bluetooth and an accelerometer, connects to your iOS/Android device, and has iOS Health and Googlefit integration. It also features jump and step counter, can calculate calories used, built-in display and more. Beacon: Beacon is a smart mat for yoga that provides interactive guidance. It connects to your laptop or smartphone via Bluetooth or USB cable to track your progress and provide you feedback. Using its embedded lights as indicators, it allows you to perfect your pose. Parrot Flower Power: The Parrot Flower Power monitors and analyzes your plant’s health and sends alerts to your smartphone. It takes care of your plants and lets you know when they need water, fertilizer, or repotting. Every plant has a different need in terms of temperature range and this is where thermistor comes in, and keeps each plant within its ideal range. It analyzes the four parameters (natural light, soil moisture, fertilizer, and temperature) essential to your plant’s health, has a database of over 7,000 plants that allows you to look at the plant’s factsheet to view photos and more. The Flower Power connects to your smartphone using Bluetooth Smart and its compatible with iOS and Android devices. Niwa: Niwa is world’s first smartphone-controlled growing system that enables you to grow your own fruits, vegetables, flowers, and even herbs. It creates perfect conditions for your plants to grow healthy and strong. It controls the temperature, humidity, and light cycles and its automated irrigation system will also water and provide your plants whenever they need it, for better growth. Just plant your seeds into Niwa, tell the app what you want to grow and it loads pre-programmed settings for your plant. Occasionally, the app asks for information like “Can you see flowers?”, if you answer “yes”, it will begin a new growth setting, changing the water, and light to make the plant to grow at their very best. Husqvarna Lawnmower: Husqvarna’s Automower is the world’s first fully automatic lawnmower that is partly solar powered, it comes with a large integrated solar panel. Jambé: Jambé is an electronic musical instrument that works with your iOS smart device and gives you unlimited sounds and wonderful playability. It looks and feels like a regular drum, built with all natural wood and metal materials, and can be placed on regular drum stands. But there is much more to this expressive, portable, and infinitely expandable device. It allows you to create music and explore rhythm, using your hands, fingers, or drumsticks. It transforms these gestures into expressive dynamic sounds. It connects to an Apple iOS device, and you can easily expand and upgrade your instrument with a few taps on the screen. DrumPants: DrumPants are really cool; its like having an entire band in your pocket. These are said to be the world’s first industrial quality wearable musical instrument. It’s true you need to watch someone play it to believe it. Soundbrennerpulse: The Soundbrennerpulse is a smart wearable device that provides haptic feedback while working along with its Smart Music Coach app to coach you to become a better musician. You can change the tempo right on your device by using BMP Wheel or tapping on the device. Its lights visualize your music; you can customize the colors or turn them off. With one person’s smartphone acting as the hub for control, you can use up to 10 devices. It’s compatible iOS and Android smartphones. Aerodrums Air Drumming Percussion Instrument: Aerodrums is an air drumming percussion instrument that allows you to drum without a physical drum kit, by making air-drumming gestures. Its very portable, provides high sound quality, and musical expressiveness on par with a real drum kit or electronic drums. Paperback Book Light: The LightWedge Paperback features patented LightWedge® technology that directs light only on the page you are reading, without bothering someone sleeping next to you. Prism Glasses: These glasses transform your view to a 90° downward angle; that lets reading a book or watching TV while lying down comfortable.Wallet Reading Glasses: These reading glasses are as small as a credit card and can be placed comfortably in your wallet.Illuminating Reading Glasses: These reading glasses feature lights in the upper corners that illuminates subjects immediately in front of you, making it ideal for reading in bed without disturbing others.Lili Lite: Its a night lamp, bookshelf and bookmark in one; to turn off the light, you’ll have to put an open book on the shelf and the light will turn off for you. 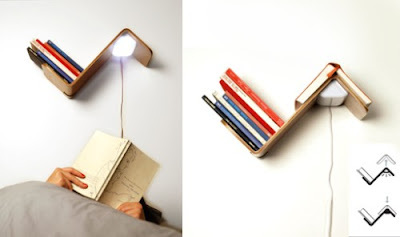 And when the book is lifted up again, the light automatically turns on. Surfears: Surfears are designed for surfers, swimmers and other water athletes, to protect the ears without affecting hearing and balance. Said to measure close to zero acoustic loss, these keep the ears duly protected from the elements while letting so much sound through that its easy to forget you’re wearing ear protection. Indoek Wax Kit: Indoek Wax Kit is a beautiful and functional case to hold you’re the wax. Its about 2.75 inches and perfect for holding most circular wax, and the comb tines are on the bottom edge and the scraper is a removable cover. Ultratide: The Ultratide by Nixon is a smart watch designed for surfers. It syncs with your smartphone via Bluetooth and provides you the most accurate and real time surf conditions like tide, time, wave height, swell direction, wind direction and speed, water and air temperatures directly to your wrist. It’s powered by Surfline, gives you 10 data points updated in real-time and provides information for over 2700 locations. You can create customized alerts for your favorite spots, and get notification when the conditions are favorable. It automatically locates the nearest surf spot to your current location. Apart from all these you can even share your sessions with your friends. Surfboard Carrier: This clever idea makes it easy for you to take along your board. Take your board over your shoulder to your favorite surf spot and once you reach, just fold it up and pack it away. Wheele Longboard Surfboard Bike Trailer: The Wheele Surfboard Carrier is a lightweight, versatile bike trailer that attaches to your bike’s seat post. It can accommodate shorter boards about 7′ 6″ below and once you extend the trailer it can take up to 10 feet. Wilson Smart Basketball: The Wilson Smart Basketball technology is developed by Wilson along with SportIQ; the ball connects with your smartphone, and tracks real-time statistics such as running distance, speed, heat maps and more. Sony Smart Tennis: This device is to be placed into the base of the racquet and it wirelessly syncs to your smartphone with Bluetooth technology. It analyzes your swing, rates it and tells you how you can improve your performance whilst playing. Trace: Trace is an advanced tracker for action sports like surfing, skateboarding and snowboarding. Zepp 3D Baseball Swing Analyzer: The Zepp 3D Baseball Swing Analyzer is an innovative training system that needs to be to attached to your bat and it wirelessly connects via Bluetooth to iOS or Android device and records thousands of data points for every swing, track bat speed, swing plane, bat angles and more. The gadget allows you to replay and review your swing in 360 degree from any angle. Swingbyte 2 Golf Training Device: Swingbyte is a mobile golf swing analysis device that uses Bluetooth and connects to iOS or Android device and displays data to improve your golf. 15 Smart and Cool Car Gadgets – Part 4. 15 Innovative and Smart Gadgets – Part 2.